TAPPING INTO THE INCREASINGLY massive Chinese tourist market in Australia, West Australian bus operator Adams Perth has partnered with Aus Highway travel to deliver Chinese-speaking trips via a new joint venture: Ni Hao WA Tours, it’s announced recently. Ni Hao WA tours will offer visitors from China, Taiwan and Hong Kong the opportunity to experience Western Australia’s premium tourist destinations complete with a professional Chinese-speaking coach captain. From mid-November, 2018, Ni Hao WA tours will offer visitors from China, Taiwan and Hong Kong the opportunity to experience Western Australia’s premium tourist destinations complete with a professional Chinese-speaking (Cantonese and Mandarin) coach captain, who will provide local knowledge of the state ensuring customers have a carefree, informative and exceptional experience, the companies state. Destinations include: the Pinnacle Desert, Wave Rock, Margaret River, Pink Lake and more. Spearheading Ni Hao WA tours are two companies that have extensive experience in the Western Australian tourism industry, it’s stated. Adams Perth, through its Adams Pinnacle Tours brand, has more than 37 years’ experience in the West Australian tourism industry. 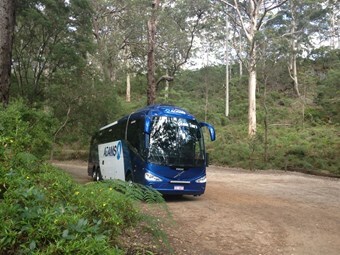 Renowned for servicing the industry in comfort and style, with luxury coaches and professional coach captains, Adams Pinnacle Tours ensures its customers see the beauty of Western Australia while receiving local knowledge of the popular destinations, the company states. Aus Highway Travel Services, based in Perth, WA, is a company with comprehensive knowledge of the China market and its team of staff has more than 10 years’ experience in the tourism industry, according to Adams. Based on the combined expertise of Adams and Aus Highway, Ni Hao WA tours will provide its customers with an experience like no other, they say. Adams Perth managing director Adam Barnard said he believed that it was only a matter of time before the natural beauty of the state, combined with the shared time zone and proximity, would make Western Australia the ideal future destination of choice amongst Chinese tourists. "With the imminent commencement of additional aviation capacity from China, we believe now is the perfect time to introduce this new and exciting brand to the WA tourism scene," Barnard said. Ni Hao WA tours will begin delivering day Chinese-speaking tours to consumers visiting Western Australia from 18 November, 2018, with plans of introducing three-day short breaks in January 2019. According to the Tourism Australia website’s International Tourism Snapshot, as at 31 March, 2018, Australia welcomed 9 million international visitors as at year ending March 2018. These visitors injected $42.3 billion into the Australian economy while total international aviation capacity to Australia grew by 5 per cent. Of that slice, from China came 1,403,600 people, up +14 per cent, spending AUD$10.9bn, which is up +13 per cent. There were 173 ‘flights per week’ inbound (fpw), up +30 per cent. As for Hong Kong, arriving were 305,100, up +28 per cent, spending AUD$1.3bn, which was up +9 per cent. All up, there was 118 (fpw), also up +10 per cent. Information specifically for Taiwanese tourism was unavailable at the time of print.